Out with the new and in with the old! Now it is all good fun perusing the beauty store shelves and taking a look at all of the advanced and exciting new products, but sometimes when were having a bad skin month we simply crave something tried, tested and reliable. As usual Mother knows best and it is highly likely that at some point your mother and her mother and her mother before that, would have tried Ponds Cold Cream Cleanser. 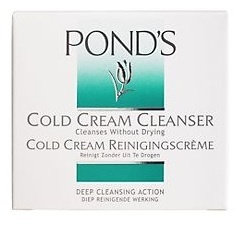 Ponds Cold Cream Cleanser is a rich facial cleanser which cleans deep down, removing every scrap of make-up and hidden dirt without drying out the skin. This product has received rave reviews for years and has even been championed by the likes of Kylie Minogue, who admitted using it everyday following the advice of her…mother. ‘It’s really changed my skin,’ she said. ‘It’s all I really use to look after my skin. It’s such an old classic. This product has really stood the test of time and even before it was introduced to beauty store shelves, many years ago the Ancient Greeks used a similar formula of emulsion of water and certain fats to look after their skin. So next time you are strolling up and down the aisles fretting about which cleanser to use, pick up Ponds and give it a whirl, you won’t be disappointed.